This sidewall was designed by the firm Denst & Soderlund in 1952-53. Thin, wavering black lines radiate out from a central point forming a large round motif resembling a dandelion flower gone to seed. The motif is repeated vertically on the panel, and is so large that it only takes two “dandelions” to cover the entire paper. The stylized blossoms are screen printed on a dull orange background. Brown, Vivian. “Stripes Create Space.” Utica NY Daily Press, September 20th, 1968. “Tower Ticker by Savage.” Chicago Daily Tribune. March 27th, 1951. 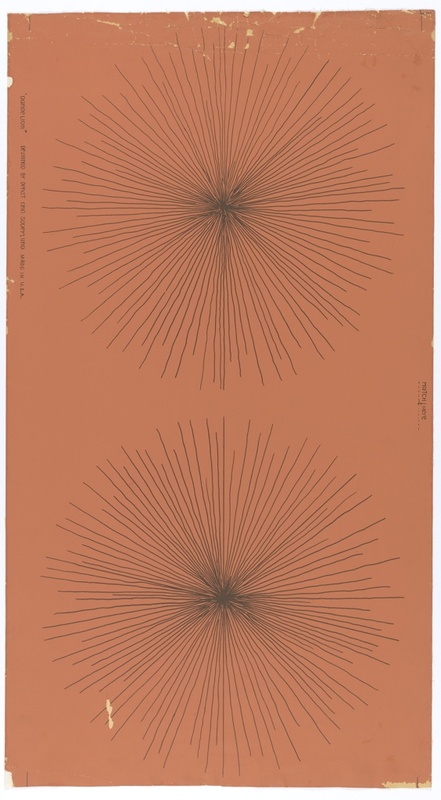 Sidewall, Dandelion, 1952-53; Made by Denst and Soderland (Chicago, Illinois, USA); Screen printed on paper; Gift of The Wallpaper Magazine, 1953-198-1.